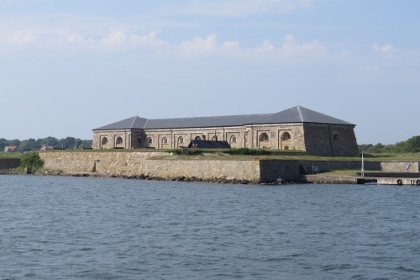 The Naval Port of Karlskrona is an exceptionally well preserved and complete example of a European naval base, built in the period when these were being established by several major maritime powers. Karlskrona is a city in south-eastern Sweden, which was founded in 1680 when the Royal Swedish Navy was relocated there. It moved from the mainland to the island which had up until then been used chiefly for farming and grazing. At the time Sweden was the dominant military power in the Baltic sea region. The island had a very strategic position with short sailing distances to the German and Baltic provinces. Most of the baroque buildings from this era are still standing, which is why the city centre is architecturally uniform. 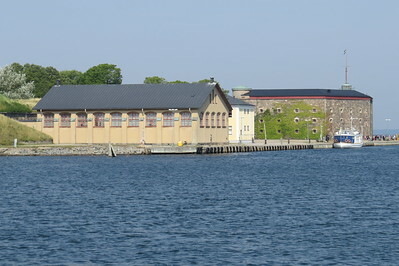 The shipyard in Karlskrona was established almost at the same time as the city. In 1711, the shipyard was Sweden's largest industrial employer with 1,100 workers. The oldest dock, the Polhem dock, is cut in the cliff itself and is still in use. This is a serial nomination of 11 locations in and around the city of Karlskrona. Somehow I think we don’t do Karlskrona full justice on this website. I had a hard time captivating the story behind this WHS too. I spent two nights here, but was away for a full day during that period visiting the WHS of Southern Öland. I should have spent more time preparing, although the Karlskrona tourist office doesn’t make things easier either. The guided tour to Kungsholmen which looks pretty interesting can only be pre-booked (they want to see your passport as it is still an active navy location), but the hours to do so are limited. And not many people would allow two days for this town of 35,000 inhabitants. As with Frederik (see his review below), my view of the central square and its monumental buildings was spoiled. In this case, the large structures of a fair were in the way. And when I went back the day after, a cleaning operation was underway to get rid of all the mess the visitors had left behind. I roamed around the city center for an hour or so, map in hand to find the most interesting places. Most of the buildings are closed to visitors. A walking tour around town would have been nice. I did find a great Indian restaurant called PM in the main shopping street – went there twice, spicy food in a pleasant ambiance. What I did enjoy was the harbour cruise by the Gåsefjärden ship. This is a regular 2 hour boat tour that leaves several times a day, and tickets can be bought at the point of departure at the Fishmarket. I was able to get a seat on the outside deck. The sea around Karlskrona is full of little islands, some are inhabited and others are or were in military cruise. After 1.5 hours I got off the boat at the Marine Museum (it’s a kind of hop-on-hop-off boat) – the museum is modern but you have to love your ships to really like it. On my drive back to The Bridge to Copenhagen I passed a sign for Skarva, a mansion that is part of the WHS too. Maybe a future reviewer could check this out? I visited this WHS in July 2016. Out of the 4 WHS I saw in Sweden this was the least interesting and in my opinion it is more of a pleasant touristy national heritage site without any particular OUV. In the past, the construction and fitting out of a sailing warship was slow and time-consuming. When at their moorings or in the docks, the vessels were extremely vulnerable but with Karlskrona, protected as it was by a natural barrier of islands and well-planned defences, the Navy had an excellent anchorage as well as a secure base for its ships. Although the naval port planning is pretty much intact and everything is well looked after, painted and clean with several naval and maritime museums, I think that having a parking lot in the main square is a huge eyesore especially since just a 2 minute walk away, there is a huge underground parking that is almost always empty! 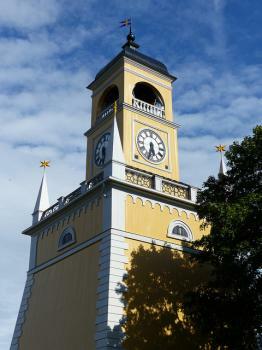 There is no single building which really stands out although I particularly liked the Klockstapeln clocktower (picture). The Fredriks Church and the Trinity Church in a way reminded me of Weimar although the latter has way much more on offer. After enjoying a pleasant harbour cruise mainly to be able to appreciate Kungsholmen Fortress's exterior and fortified islands, I decided to walk the heritage trail to visit most of the inscribed area and the main sites. Just in front of the main boulevard next to the main square there is a UNESCO flag and beneath it is the UNESCO plaque proudly displaying Karlskrona's inscription. After looking up at some of the ornate buildings I headed towards Stumholmen island which is connected with a wooden bridge. Since 1683 this has been the production and provisioning area for the Swedish Navy and an off-limits military base till the 1980s. 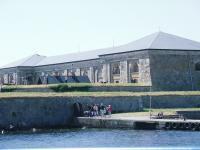 Now there are several hangers such as the Flyghangar 4, army sheds, bastion walls, iron cannons, marinas, a lighthouse and the Kungshall Fortress just opposite the sea fort of Godnatt. Godnatt is like a miniature roundish version of Fort Boyard in France. Next, I visited the Naval Museum with its submarine hall (notably Neptun and Hajen) and several warships and traditional ships. My favourite part of the museum was the collection of figureheads. While walking the heritage trail, I passed by the off-limits dockyards with their old fortified entrance, the cabinboys' barracks (one of the oldest educational institutions of Karlskrona), the Fiskorget and finally at sunset I followed the locals to Stakholmen island after having bought a takeaway doner kebab. I enjoyed the panoramic view of Karlskrona from here and it was a great way to end my visit before heading to my hotel. When I first saw Karlskrona, a prosperous looking town on Southern Swedish coast, I was quite impressed with its beautiful location with beautiful Baltic Sea, many fortified islets and countless yachts and boat mooring in the marinas and bay. The market square was the first place I saw, reputedly to be the second biggest square in Europe; however I was not sure for this superlative claim since I could not feel any grandness from this square. The Frederick Church in the square was quite pretty, when I entered the church I was surprised with its white marble interior that make the church looked pretty lavish, until I discovered that the marble was actually a wood painted! Since I visit on the weekend, the square was full with market stalls and many part of the square had turned to be a big car park. The market was lively but the car park really ruined the view. My next destination was the Church of Holy Trinity, it was closed during my visit, but the exterior was quite interesting with very Classic Italian touch. 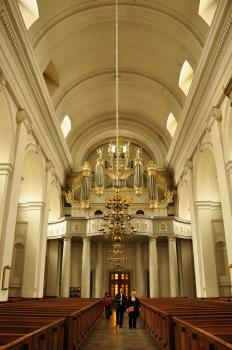 Then I leisurely walked to see the red Admiralty Church, a biggest wooden church of Sweden. This church had strong link with navy so many decorations were related to war history, but in general the church was quite lovely and the story of Rosenbom in front of the church was quite unique. After nice walk along the coast passing many nice fortress wall and grand manors, I was at Marine Museum; the place was quite popular with its cafeteria as I found that most of tourist I met in other places of the city came to have lunch here! In my opinion the taste was quite OK but the portion of the buffet was the real deal. The reason I came to see this museum was not the cafeteria but its great collection of ship figureheads, a real gem of my Karlskrona trip. I finished my day at Karlskrona; it was a nice day, but no sites that really made me want to come back or praise. The city was not pretty and its monuments looked decay. The beautiful location was this city main asset. Seeing the navy activities were also interesting, the city was full with them similar to students in the university town. Nevertheless Karlskrona will, for sure, not be on my list of recommended places to any Swedish tour. Karlskrona is Sweden's major naval port and a good example of a planned town of the 17th and 18th centuries. The WH site covers several buildings in the city itself and on the islands nearby. The major attraction is the huge Kungsholmen Fortress, which is still today operated by the Navy, so you need a special permit to visit. The tours on the day of my visit were already full, so I could only do a harbour cruise that stopped at the island but did not include a visit. There is still quite a bit to see from the outside, though, and it is certainly an impressive sight. 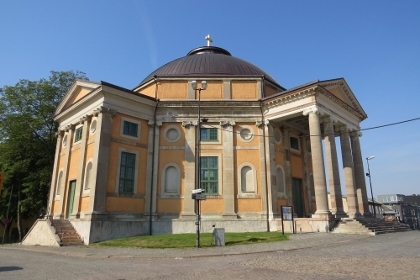 A pleasant stroll through the city takes you to several historic sights, including churches (the Admiralty Church is the largest wooden church in Sweden), squares, fortresses and other military installations. Everything here is quite nice and well-maintained, and you can easily spend an enjoyable day in Karlskrona. 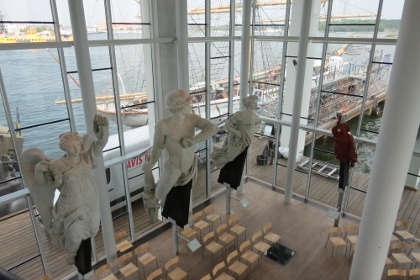 Don't forget to visit the Maritime Museum, though - this is really a first-class sight. Perhaps because I had a fine day for my visit to Karlskrona I left with a better impression than Paul. I found the new museum on Stumholmen very interesting, and toured around the Kungshall bastion on that island before returning to Trosso to see the listed buildings there. The colourful wooden cottages of Bjorkholmen were most attractive. I then went to Fisktorget and joined a harbour cruise for the afternoon and visited the Drottningskar citadel, Kungsholmen fortress, Ljungskar magazine, Godnatt tower and Koholmen while enjoying a high degree of comfort. Sweden has identified some wonderfully innovative subjects for its WHS list – We have seen most of them and had looked forward to another “interesting” inscription at Karlskrona – “a planned Naval Port from the late 17th century”. Indeed we do usually enjoy this sort of site but, for a number of reasons, Karlskrona failed to ignite our interest. Despite the town being pleasant enough and largely intact as per the original plan, the historic naval aspects didn’t come across that strongly during our visit. It is certainly laid out in grand proportions, starting with Stortorget, or the main square, which is said to be “one of the biggest and most beautiful in northern Europe”. The town’s topography is complex and comprises a number of islands, some of which have been joined together by causeways/infill. Some of the areas are quite modern and industrial as it is still Sweden’s primary Naval centre and a shipbuilding town. Whilst the core has a reasonable historic feel to it some of the forts and naval buildings are spread out way beyond the town center, some on the islands, and we did not attempt to search out all the nominated buildings - perhaps the chilly dull morning made these distances seem windier and duller. Unfortunately the town’s Maritime Museum wasn’t open (I understand it has since moved to a fine new building and that its exhibits have been considerably enhanced including some real ships! ), the county museum had little of interest and the harbour seemed to be largely a yacht park. We certainly didn’t gain any great feeling for its “specialism” as a historic “Naval” town – alright, we could see the grey Baltic - but that was about all! There are other planned 17th century towns relatively close - eg Fredericia in Denmark and Kristianstad in Sweden itself which admittedly lack the “Naval” dimension, but which we found just as interesting as “planned towns” per se. Indeed I can’t have noted anything particularly photogenic either, as the only photo from Karlskona we have is of us in “tourist mode” playing with the wooden statue of “Rosenbaum the Beggar” (photo). This is situated outside Sweden’s largest wooden Church Amiralitetskyrkan (Admiralty church). To quote - “It depicts ex-constable Matts Rosenbom, who froze to death on New Year's Eve in 1717. He was found in the morning with his hand outstretched, his hat pulled over his ears, and a beggar's bundle on his back. Since then, the wooden statue of Rosenbom has tipped its hat to all who give alms to the poor”. So did we just “flunk out” on what Karlskrona had to offer or is there an available WHS niche for another naval town? Ship building and naval history are not well represented on the list compared with eg rail transport, mining or manufacturing. There is Bryggen for maritime trade but Karlskrona is the nearest there is to a “Shipyard”. The UK failed to get “SS Great Britan” accepted in 1988 on the basis that movable objects are not acceptable as WHS but it still has Chatham Dockyard on its T list and this is cited in the comparative analysis of the Karlskrona inscription as being “exceptionally well preserved” with the comment that it is “complementary” to Karlskrona. I will not pass comment on how it might measure up as I deliberately avoid reviewing any sites from within my own country (Many of the reviews on this site demonstrate how easily “ugly ducklings” can become “patriotic swans”!). Over recent years Chatham has been undergoing considerable development as a “tourist attraction” and no doubt the lengthy processes required to gain “inscription” are in train – it will be interesting to see what species of “bird” eventually emerges! Perhaps Karlskrona has not had the last word on this type of site. Karlskrona lies in the south of Sweden, and is connected by train or car from Malmö or Copenhagen. There's also a frequent (but slow) ferry to Gdynia in Poland. Not all locations are easy to reach: Skärva lies outside of the city in the surrounding countryside, while Kungsholmen and Drottningskärs Citadel can only be reached by boat. Brick architecture: The "Finnish Church"